The Church of the Dormition of the Virgin has little changed since my childhood in Greece. You can see the icon of the Mother of God on the left, leaning against the altar screen. ThisByzantine icon from my Greek village church, a treasured image of theVirgin and Child (shown above) has been part of my life ever since Ican remember. This late 19th century icon of The Theotókos ("She WhoGave Birth to the Lord"), is a wonderful example of the Byzantineiconographic tradition. I am delighted to share itwith you in the form of a special Christmas card in two variations. 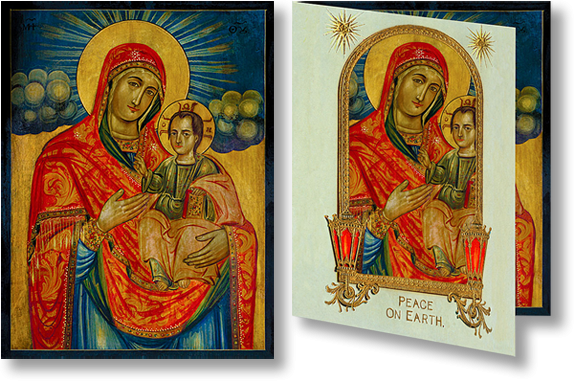 Both feature the icon of the Mother of God on the inside, and the greeting, "May The Spirit Of Christmas Fill Your Heart," along with the timeless wish "Peace On Earth." One version — the Uncut Window — requires no cutting, and features the "May The Spirit…" wish inside the golden, arched window that decorates the front of the card. All you need to with this version is download, print,fold — and send to someone you love. TheCut-out Arched Window version requires the removal of the inside of the arched window (roll your mouse off and on the image at left, below, to see the two versions). A 1911 vintage greeting card featuring a gold arch and two candlesprovides the arched front design for the Icon Card. Run your mouse on and off the image above to see the two versions of the Icon Card. The first version is printed and folded; in the second, the arched window is cut out. Cut-out Arched Window Version:1. Score along horizontal fold. 2. Cut out white area inside of goldframe through pages one and two, creating an arched window. 3. Scorealong vertical fold line and fold. Uncut Window Version: Skip step 2 above. Created a time when most Orthodox were illiterate, anicon didn't just serve as a holy object of veneration, but as acatechism lesson. In this icon of the Virgin, The Christ Child isshown as much older — foreshadowing His ministry — and holding the Gospel. On Christ’s halo the Greek letters Omicron, Omega, and Nu spell out “O On,“ He Who Is. I must confess that, as a child looking at this wondrous depiction ofThe Panagia (The All-Holy One, as the Mother of God is called by the Greek Orthodox), I wondered: what those green apples weredoing there among all the gold? They're not apples at all, of course, but stylized clouds — areminder of the Orthodox belief of Mary’s Assumption into Heaven.